Software for Coin Dealers. 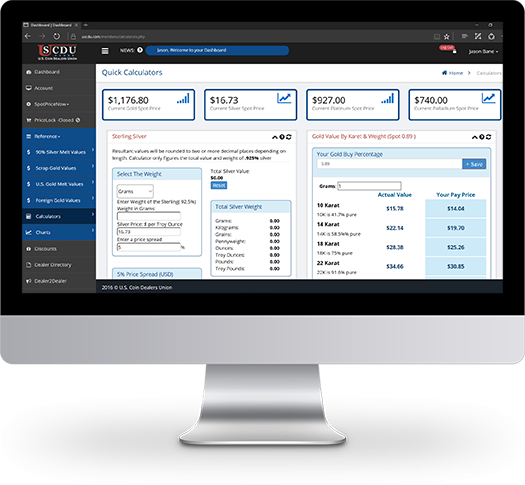 More Time, More Control, Save Money, Prevent Staff Errors, and More. 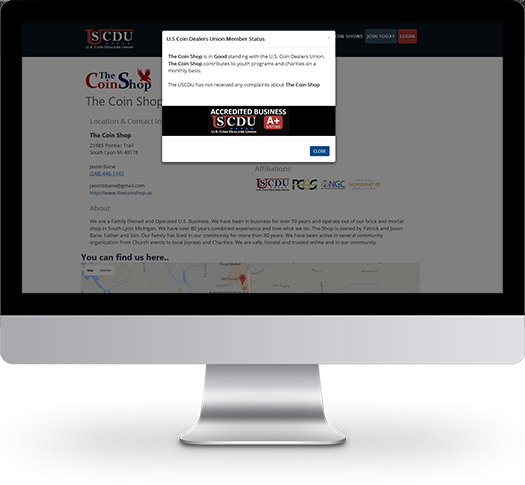 All of our services can be found via our easy to navigate Member Dashboard. 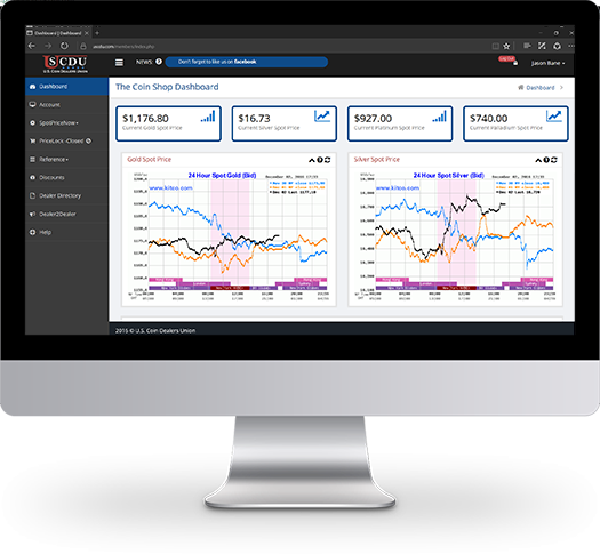 From this dashboard you are able to sell coins and bullion, update premiums, add information and access real time pricing information. 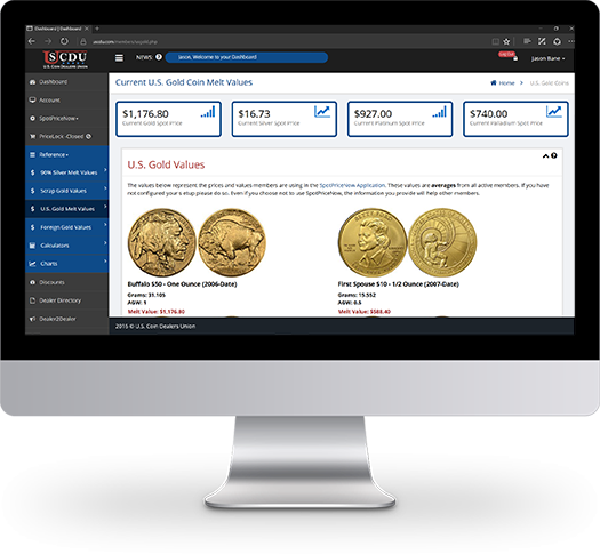 We have created these features and designed this site specifically for coin dealers. 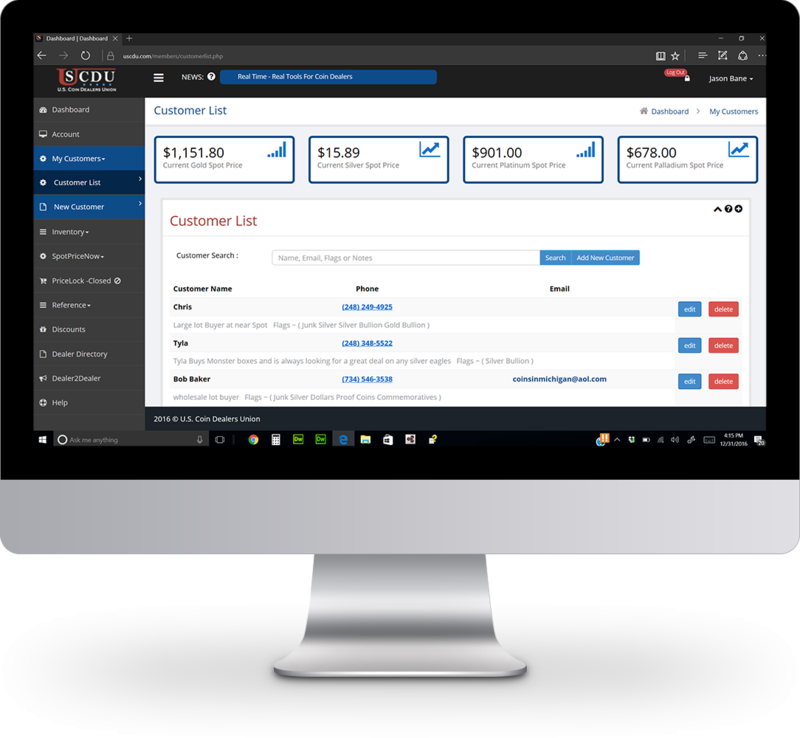 Sell Online.. Members are given a free e-commerce platform to sell online. This included service is simple to use and takes no set-up. 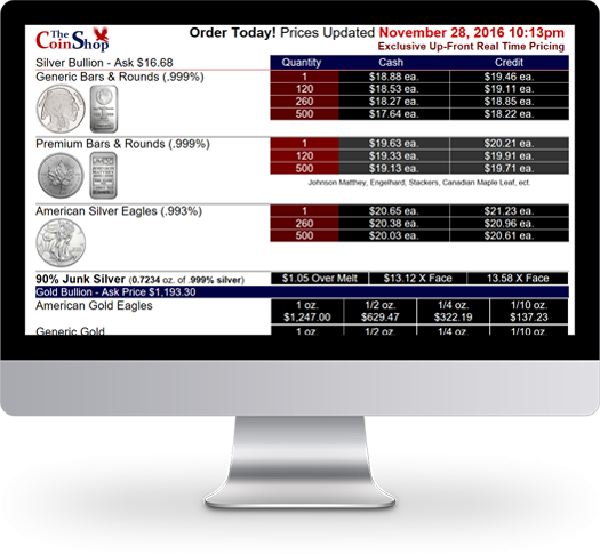 Members are able to list bullion with updated real time pricing, In Store Only Items, one of a kind items, and more. We do not charge Fees or Percentages. 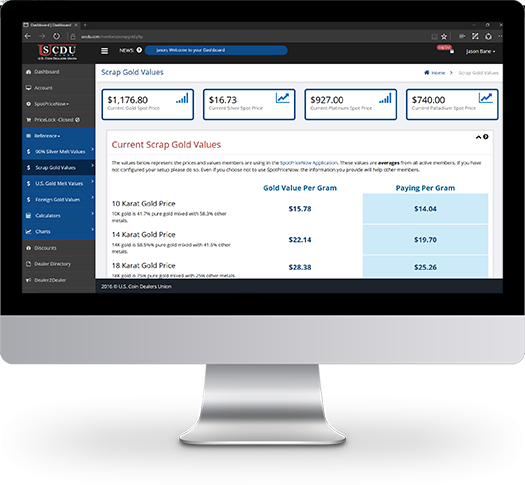 Members can display their own updated retail bullion prices in real time to customers and or staff. It uses live spot prices to adjust your own retail prices with market changes. Add price breaks and credit charges. 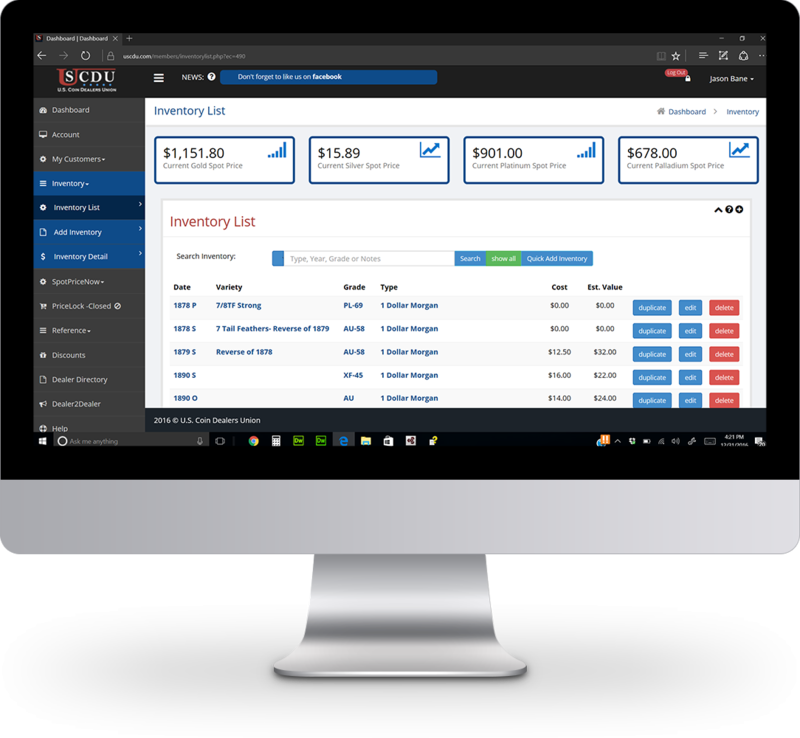 Membership includes an inventory system. We built this so that its quick and easy to enter items, simple in fact. We have included over 100,000 U.S. coin types and variations. Easy entry and searchable. Need to find buyers for something specific just search your customers by flags or notes. Stop staring at your cork board full of post-its and business cards. This service shows you the current value for scrap gold based on karat per gram. It also allows you to enter your buy percentage and will show your own current buy prices per karat per gram. 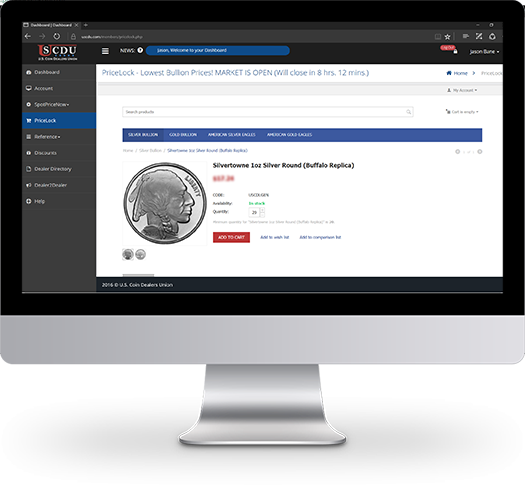 The U.S. Gold Coin Melt Values tool shows a picture of the obverse and reverse of the coin, gram weight, actual gold weight (AGW) and current melt value..
Members that set values in SpotPriceNow help support other members of USCDU. These values are averaged and made available to view on everyone's member dashboard. It's like an insiders view of market changes and fluctuations. Your business listing in our directory helps with online visibility and promotion. 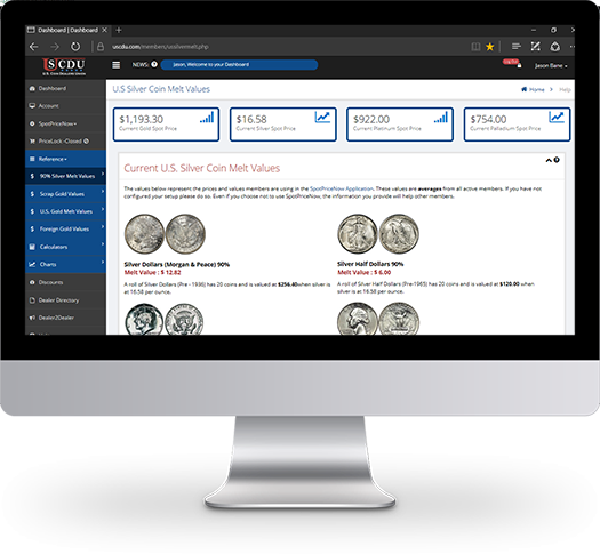 Unlike search engines our directory is specific to coin dealers and built to help you highlight your services and affiliations. 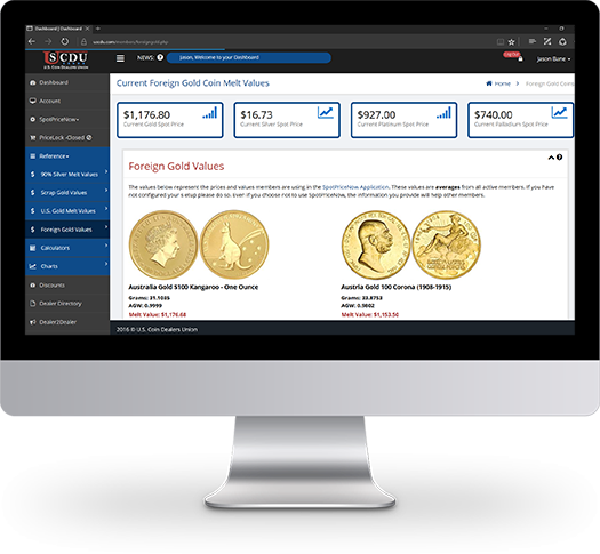 The foreign coin values tool shows a picture of the obverse/reverse, gram weight, actual gold weight (AGW) and current melt value. We have included a comprehensive list of foreign bullion coins and their melt values. Although our service gives you most values at a glance, we have included a few miscellaneous calculators to help figure out things like sterling silver, 90% silver face values and scrap gold by weight. Price charts are updated in real time and are prominently displayed on the member dashboard. Provided by Kitco and updated every minute, ensuring you are always looking at the most recent pricing. Similar to the tools referenced above however this one is for U.S. 90% silver coins. This tool shows a picture of the obverse/reverse of the coin along with the weights and silver melt values. Members recieve discounted Web Hosting, E-mail, Web Design or Re-design Services. We are here to help with low cost dedicated hosting for your website and email. Members recieve a 25% discount on our standard web services. Get your site updated today!